I am done with my challenge, it ended on Saturday. I had a glorious lunch to go to on Sunday so I ended it one day early, no harm done. It was really good this time and I did not crave or miss anything at all. 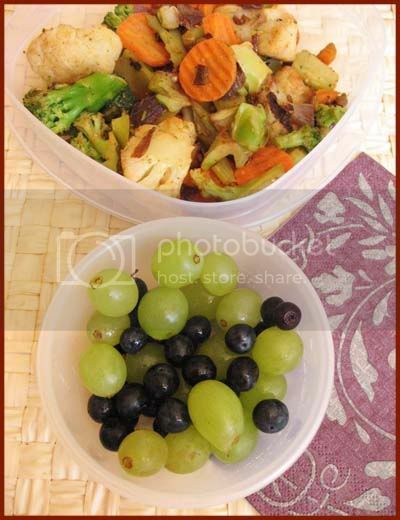 The meals were simple and yet we ate a lot of veggies and also heart-healthy fish. I stuck to eating no grains, no processed food, no sugar and almost no meat. I did bend the rules and ate out on two nights. One day it was salad, the other day a chicken vindaloo which we ordered home. I think bending the rules a bit and also a simpler meal plan helped to do the whole thing without any stress and accept it as a life style instead of one week fling. If you ask me about weights, honestly I did not weigh in, neither before nor after. The weighing machine at home has given up after umpteen weighing of suitcases whenever the parents are here and gets totally messed up if humans are aboard. The gym whose weighing scales I trust was not visited. I know I am nowhere near the target weight which the BMI calculators predict for me, man I would rather grow vertically than reach that pathetic low weight. But I do feel lighter and better, I think a week of restricted good eating does that to you anyway. The best thing is I have lost in inches, I can feel it , really. Ok and the real proof of the pudding is in I could gracefully fit into the saree-blouse my Ma got stitched for me and sent over last week. This is no mean feat if you know my Mom and my blouse fitting saga. My Mom is a health freak and is either exercising or eating small portions of healthily cooked food. She wasn't always like this but her arthritic knee has made her very watchful of her and consequently my weight. She gets my blouses stitched by the tailor whose template is from my wedding days. So most of the time I am huffing and puffing to get into those wry pieces of fabric which think I am Malaika where in real life I maybe Mayawati. Now I am not sure if the tailor lost his original template but this time his creation was a much easier fit. A reward worthy of the challenge. Before I go into the recipe I would like to make it clear that the no-grain diet is not necessary the best thing to and will depend on the individual's health and such factors. As some of the readers have asked, whole grains are definitely good for you in small portions. Basically the No-Grain Diet is based on the idea that meals high in grains, sweets, and starches promote elevated insulin levels, causing you to become hungry soon after you have just eaten. This is referred to as a "grain addiction" - when the cravings trigger you to eat more of the "wrong foods" and a harmful cycle ensues. So getting rid of the grains reduces your carb cravings. 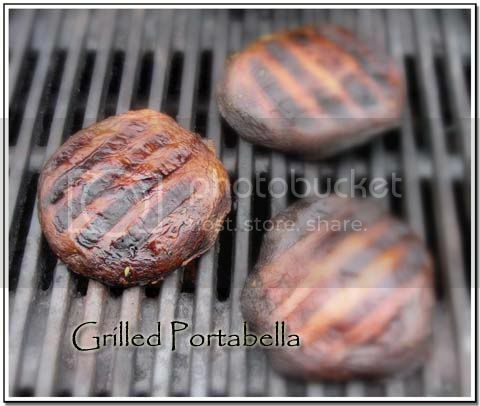 Back now to two more recipes which are much welcome in our home on no grain days are a Grilled Portabella Caps and a Salsa Soup. I have no pics for the Salsa Soup but trust me, it is a wonderfully tasty soup. Remove stems and wipe portabella caps clean with a damp paper towel. Combine Olive oil, Lime juice, Sambal Olek or Hot Chili Garlic sauce, little Honey, Garlic salt and Red Chili Powder.Brush the dressing on the outer side of the mushroom. Place mushrooms on their backs, with dark "gill" side up on the grill. Brush dressing over gills. Grill, gill sides up. serve whole or sliced. Heat Olive Oil in a deep, heavy pan. Add a pinch of red pepper and about 1/2 tsp of cumin seeds to the oil and stir briefly. When the cumin sizzles, add chopped onion and fry till soft. Now add your salsa. Note: Either home made salsa or the jar will work. If you like it hot add chili powder or use a HOT salsa. Cook the salsa and oil together for couple of minutes, stirring constantly so that it does not burn or stick. Add the black beans, and the corn. I used a can of black beans. Next, add the organic low sodium vegetable stock and stir all to blend well. If you don't have stock use plain water, add salt to taste. Bring this mixture to a full boil and reduce heat to medium low. Simmer the salsa soup until the corn/bean is completely cooked . Turn off heat under the cooking vessel and stir in a bunch of chopped cilantro. Stir in avocado chunks on top . Toss a bit of cheese on top of that. Top with a few tortilla chips or papad. Process till chunky to get your own salsa. Add some minced coriander to the prepared salsa.It was delicioso.Use this for the soup. I will be on a break until next week. I haven't been able to visit blogs as much as I would have liked to the last week and the trend will continue for the next week or two. I am sorry but I will be back. Trivia: Aztec lords started to make a mixture of tomatoes with chili peppers and ground squash seeds as early as 1521. They used it as a condiment, to be eaten alongside turkey, venison, lobster, and fish. It was Alonso de Molina who first gave the name ‘salsa’ to the mixture, in 1571. What are meal plans if not to be altered ? So after eating grilled and baked for two consecutive days my heart was craving something fiery. I found that D survives such stuff better, me I want spices in my life. And then there was this jewel red, fragrant spice that had just arrived.Like a new bride it sat in my pantry, shy and coy, fiery from inside, waiting to be introduced to the rest of the family. I too was waiting for an opportune moment, to make memories out of the first introduction. To make things more clear lets cut and do a flashback. 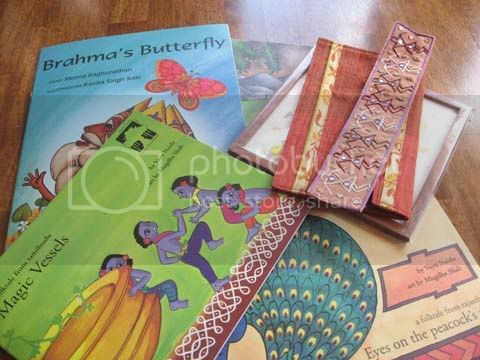 Few weeks back Dear Nupur of One Hot Stove had a generous giveaway at her blog. Of the millions who responded I was one. I didn't hope to win. Winning by luck is not my forte, I have better chances when hard work is involved. So of course I did not win. But life is not totally unfair and there are extremely nice judges like Nupur who will mail losers and ask them if they want the prize even though they have lost !!! And what a prize, the jewel red, fragrant spice from far away Kolhapur, the authentic Kolhapuri Masala. Cut to present. So yesterday I tossed the idea of baking salmon and made a Fish Kolhapuri with salmon instead. I picked up this recipe but altered it because I was using the pre-made Kolhapuri Masala. I also got helpful and prompt tips from Nupur on using the masala, the right way. 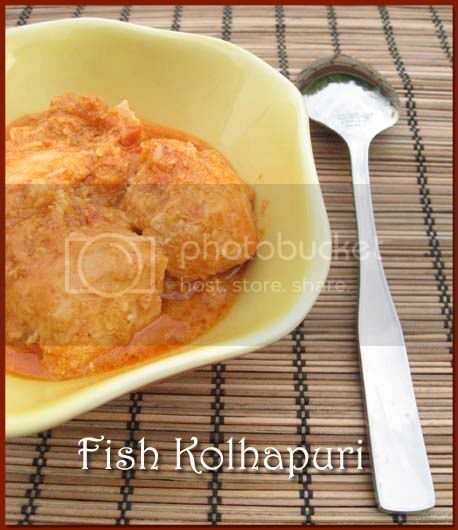 Fish Kolhapuri with salmon was the best salmon dish we have had till date. With the sweet fresh water fishes that I love, this dish can only get better. It was rich in texture, gorgeous in color and very flavorful and fiery in taste. Fish Kolhapuri and Dal Fry again flavored with Kolhapuri masala was our meal yesterday night. The challenge is still on but now it more flavorful. I still had some of the masala paste remaining and since S loves Paneer, I made a Paneer Kolhapuri exactly the same way I made the fish. It was delicious to say the least. Thanks Nupur. This is a spice mix we will treasure for ever. If you don't have access to the Kolhapuri Masala, you can make your own from Nupur's blog or this recipe. You can also follow the original fish recipe and make the dish but I bet mine was more flavorful with that gorgeous masala. Marinate the fish pieces (10-12, 2" x 2" pieces of salmon) in 1 tsp of garlic paste, 1 tsp lime juice, Red chilli powder, salt and 1/4 cup yogurt for half hour or more. Note: use any fish of your choice here. Add about 1/4 cup of grated coconut and fry for couple of minutes. I used frozen, use fresh if you can. Cool the above and blend the whole mixture to a paste with aid of a little water. You need a thick paste so don't add too much water. Heat some more oil and gently add the fish pieces. Lightly brown the fish pieces on both sides. Adjust for seasonings and garnish with finely chopped coriander. Add the paneer cubes and lightly brown them on both sides. I had other posts in mind for this week, posts that have been sitting in my draft. But then something happened last week. For the first time ever I met a blogger in real life. For whatever reason I have never taken a blog friendship to the next level with e-mails, chats, social networks, phone calls and then live. Occasional e-mails yes but nothing beyond that. So even when I told her that I would be happy to meet her I wasn't too sure. But am I glad that I did. It was wonderful really and it didn't feel like meeting a stranger at all. She was extremely sweet and got me and S some delightful presents. The Tulika books for S are a treasure. 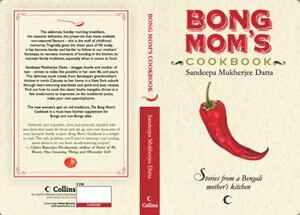 I made a complete bengali meal for her and the menu was Rice, Dal, Begun Bhaja, Jhinge Chingri Posto, Pathar Mangsho and Aamer Chaatni, the dessert didn't happen. But her no-grains/limited grain diet for the last 12 years inspired me and I thought of doing the 7 day challenge again this week. Kay's post gave me the final shove. As I had mentioned earlier my main problem was the large amount of prep work that I needed especially to pack lunch etc. So I am keeping it simple this time. I got 6-7 packets of frozen vegetables, different blend like Italian, California etc. They are not processed, just chopped and frozen. I am going to steam them and pan roast them for lunch. Different spices and difference in vegetables will bring in the much needed variety. I will have a simple Dal or soup along with it. Dinner will be grilled veggies and salmon on most days. Snacks will be Kala Chana and Papad. I am going to have Tea twice a day. Also I am going to have a little honey on some days. Add some chopped red onion and saute till onion is soft. Add spices like Garam masala or Corriander powder or anything else that you fancy. I buy Gerber Organic Baby Food for my daughter from my local Path Mark Store every two weeks. A month(in May-June time) or so back when I opened the Green Bean container that I had bought a day earlier, it didn't look quiet right.On checking the dates, we saw the expiry date on the product was Jan 2009 (i.e. the baby food had expired 4 months back). We promptly checked all the other Gerber Baby Foods in our pantry. The Fruits were all fine with an expiry date of 2010 or even 2011. But one or two of the Veggies had the expiry date as Jan 2009. D ,my husband took them back to the store and notified customer service about it. They simply said, they would remove the expired products from the shelves. Today I was back at the same store. Now I was more aware and I checked the dates before picking up the Gerber containers from the shelves. However there were very few of the Organic Gerber varieties available and so I started checking the Beech & Nut Naturals. And what do I see ? Products with expiry date stamped as April 2009. Today being July 18th, 2009 the product had already expired 3 months back and yet they were still sitting on the shelf. When I complained to customer service, they simply said it was a vendor packaging issue and were not even apologetic. They did say they will remove these products from the shelves. But I don't understand how the store could be so careless and nonchalant even after our initial complaint. These were all Stage 2 foods and could be potentially harmful for a 6+ month old baby. The way the expiry date is printed, it is not something that is at your face, you need to look for it and I am sure many parents would not pay much attention while picking up these packs. I have filed a complaint with the Better Business Bureau. I would urge all parents to check the dates on such packaged baby foods and lodge a complaint when they find something amiss. * Please don't leave a comment if you think I am terribly wrong in feeding my baby Gerber. All constructive comments are welcome. 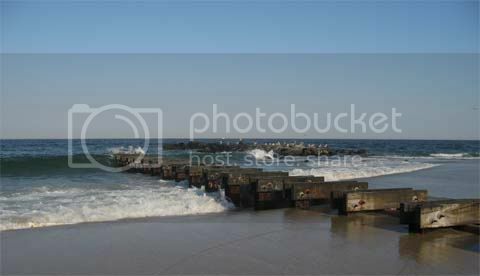 Edited to Add: I have sent e-mails to PathMark customer care and to the mayor's office of the township. No one has got back. I don't think the manufacturers are even responsible for this, so haven't called them yet. My Dida, my Ma's mother, my maternal grandma passed away last week. The memories of her that I carry in my heart can not be captured in a blog post and it is no point saying how dear she was to me. Though she was old and frail, I was really hoping to see her if and when I visit India later this year but that is not to be. She was a wonderful cook but I never ever attempted to learn any culinary skills from her. I was too happy eating, thinking that is the norm, she would whip up one delicacy after other while we just gorged on them. Many of her cooking traditions has come trickling down via my Mom of course but to make a Chingri Cutlet(Prawn Cutlet) or Kankra Jhaal(Crab Curry) or even Khasta kachori like her will never again be possible. It was only last week that I was cursing the guy for starting his seeds late and now see what he has. His squash plants have blossomed and there are pretty yellow flowers all around. Didn't I say he was D best. Ok I never did, so what !!! A couple of years back we used to have a tiny pumpkin patch which never gave us any fruit but we were only too happy with the blossoms and the leaves and stems(kumro da(n)ta). The stems and leaves were put to best use if either set of parents were here. I usually don't have too much patience to chop the stems and leaves and make a da(n)ta charchari so this time there is no pumpkin but the two lone squash plants have made us happy. However we didn't get the timing right to harvest the blossoms. One day all happy with the blooms, I clicked pics and by next day the bloom had closed. "Harvesting squash blossoms requires careful timing. You want them before they bloom, though sometimes it’s tough to distinguish between a bloom that opened and closed, and one that has yet to open." 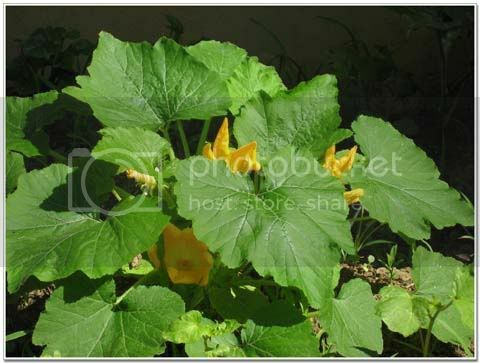 Squash have male and female blossoms on the same plant (monoecious). The blossoms of both sexes are open and fertile only during the morning hours of one day. During this time pollen must be transferred by bees or by a person. The male blossom may open a second day, but the pollen will no longer be fertile and the blossom will close, wilt and drop from the plant that day or the next. See what ego these male blossoms have ? The females are no less, they make those guys wait like anything . There may be 3 to 4 male blossoms opening for several days to a week before the first female blossoms open. Plants are such a miracle of nature and there are so many things you wouldn't know unless you see them happening right there in your backyard. Like the other day I saw my methi plants close their leaves and go to sleep at night. They opened up once again at dawn. Has anyone noticed that or can I just say I "discovered" the phenomenon. So anyway we had only closed blooms to fry and that too only four(the male flowers) of them. Once you have those blossoms, remember to gingerly pull out the stamen before you cook, since the stamen makes it bitter. D made the squash blossom fries and since he does NOT measure, this is how it goes. Last weekend after a long time, read really long time we were at Whole Foods. So of course we had to eat at their salad bar and there I had something which was exactly like our very own Bengali Fulkopi Bhaja but with some more Indian spices. Heat Olive Oil in a Frying Pan. Add some chopped red onion and fry till light brown in color. Add some ground corriander powder, fennel powder, very little garam masala powder, paprika and a little red chili powder. Fry the masala with a sprinkle of water. Add the cauliflower florets. Add salt to taste and mix well with the masala. 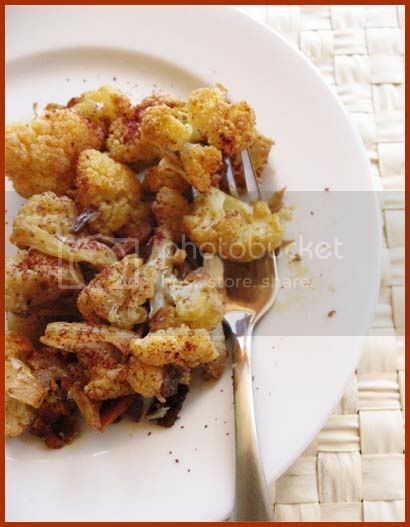 After frying the cauliflower for a couple of minutes transfer the entire content to an oven safe bowl or tray and bake at 350 F for 30-35 minutes. The cauliflower will be done and lightly crisped at the end of the process. Sprinkle a generous helping of sumac on the beautifully roasted florets and enjoy. What delight did you grow to eat today ?